"She's the most precious thing in the whole world." Magnolia has unveiled the official trailer for the western comedy Damsel, which premiered at the Sundance and Berlin Film Festivals earlier this year. Made by the Zellner Brothers (of Kumiko the Treasure Hunter), the film is a "loving reinvention of the western genre" that "showcases [the Zellners'] trademark unpredictability, off-kilter sense of humor, and unique brand of humanism." The story follows a young man who brings a miniature horse to his bride-to-be, only to discover she has plans of her own. Robert Pattinson co-stars with Mia Wasikowska, with a cast includes David & Nathan Zellner, Robert Forster, Joseph Billingiere, Morgan Lund, and Ray Kelleher. The 'lil horse, named Butterscotch, totally steals the show. One of the best indie comedies from Sundance this year. It's the age of The Wild West, circa 1870. An affluent pioneer named Samuel Alabaster (Robert Pattinson) ventures deep into the American wilderness to reunite with and marry the love of his life, Penelope (Mia Wasikowska). For his journey he brings Butterscotch, a miniature horse intended as a wedding present for his bride, and enlists drunkard Parson Henry (David Zellner) to conduct the ceremony. As they traverse the lawless frontier their once simple journey grows treacherous, and the lines between hero, villain, and damsel are blurred. 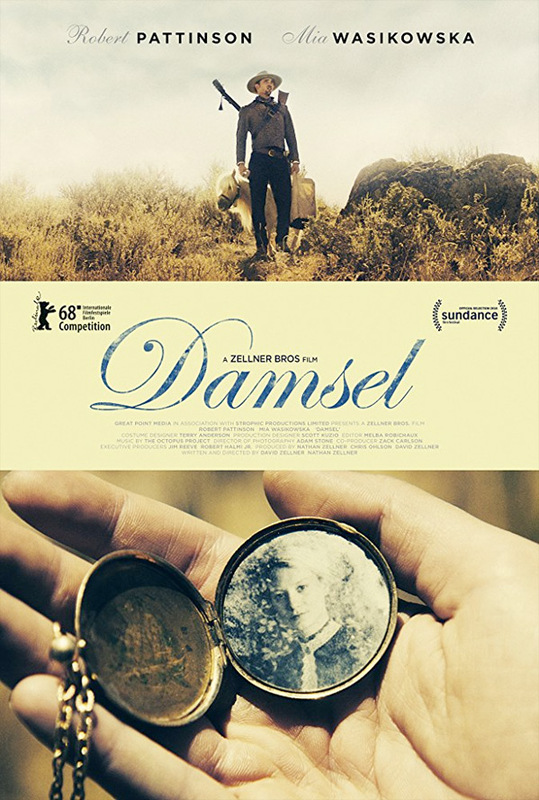 Damsel is both written and directed by brothers David Zellner & Nathan Zellner, of the films Plastic Utopia, Frontier, Goliath, Kid-Thing, and Kumiko the Treasure Hunter previously. This first premiered at the Sundance and Berlin Film Festivals earlier this year. Magnolia Pictures will release the Zellners' Damsel in select theaters starting June 22nd this summer. Who's down? What do you think?